Let’s start with the basics: keeping hair clean(ish). Between camping in a muddy field, unpredictable weather and the no-shower situation, your festival hair might not be looking as flawless as you’d hoped a few days in. Follow these expert tips to give your hair a bit of oomph on the go. To achieve festival hair goals, it’s all in the prep work. Before putting hair through its paces stage-side, treat it to an intensely moisturizing treatment, like Nutri-Enrich Deep Nourishing Mask. It contains soothing vitamin E to leave hair smooth, hydrated and strong, and protects your strands from getting too dry and brittle over the coming days. Apply the night before you head off to the main stage and your hair will look as good IRL as on the ‘gram. Next up, dry shampoo – your ticket to a fresh, volumized mane in a spritz. Hold EIMI Dry Me at arm’s length away from hair and spray directly onto roots. For added texture, massage the scalp with fingertips to blend dry shampoo through hair, creating volume and lift at the crown while instantly absorbing grease and oil. If you’re going for a sleeker vibe, brush it through hair and roots to leave a smoother, silkier finish. Whatever your daytime festival hair look, always sweep hair up into a super-high topknot at the crown of your head before hitting your sleeping bag. Lightly twist and fix the night into place with Kirby grips, then release in the morning for a volume boost without a single harsh hairband line in sight. Easy. This is the most extra way to cover greasy hair. If you’ve finished your can of dry shampoo and there’s still not a shower in sight, glitter roots are here to save the day. Step 1: Create a slick centre parting using whatever you have to hand: a brush, comb, or fingertips. Step 2: Through the section of roots where you want glitter to appear, smooth on EIMI Shape Me hair gel. Step 3: Next, while the gel is still tacky, use a makeup brush or your fingers to press glitter on top. Go as bold or subtle as you like when creating your high-shimmer finish. Step 4: Tease remaining hair into your chosen style – we love space buns, boho braids or low-slung ponytails paired with glitter roots. Nothing says ‘I’m with the band’ like summer-ready festival hair accessories. Keep hair off your face while you dance the night (and day) away with an ultra-cool headband. Pair your go-to festival hair accessory with tousled texture for effortless cool. Step 1: Apply EIMI Ocean Spritz texture spray through hair that needs a bit of oomph. Ruffle lightly around roots with fingertips to create texture and add movement by scrunching through the mid-lengths to ends. Step 2: Put on your finest festival headwear over tousled hair. Lightly tease roots with fingertips to lift and keep the volume in your style. A festival hair favorite: loose braids and tousled waves. 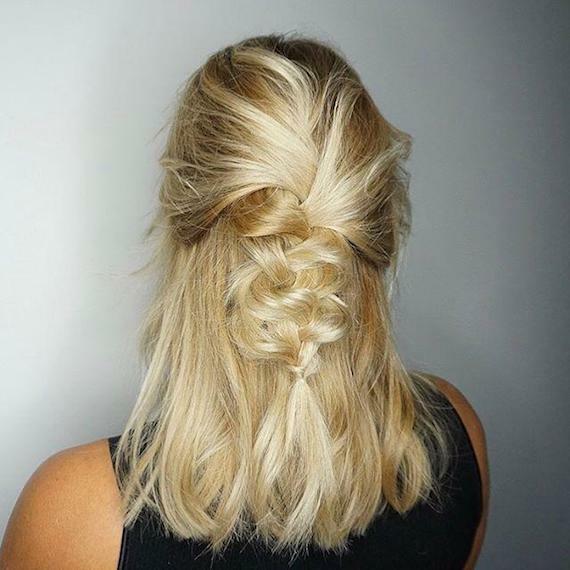 If you’re getting to the end of your festival weekend and your hair is feeling a little messy, tease into a ruffled braid to save your style. Step 1: Using fingertips, sweep back the top half of your hair and separate into its own section. Step 2: Plait the top section of hair into a fishtail or reverse braid, securing at the end with a small, clear hairband. Step 3: Lightly tug the braid at the sides to loosen and create laid-back, tousled texture. Finish by misting with EIMI Flexible Finish hairspray to set into place. 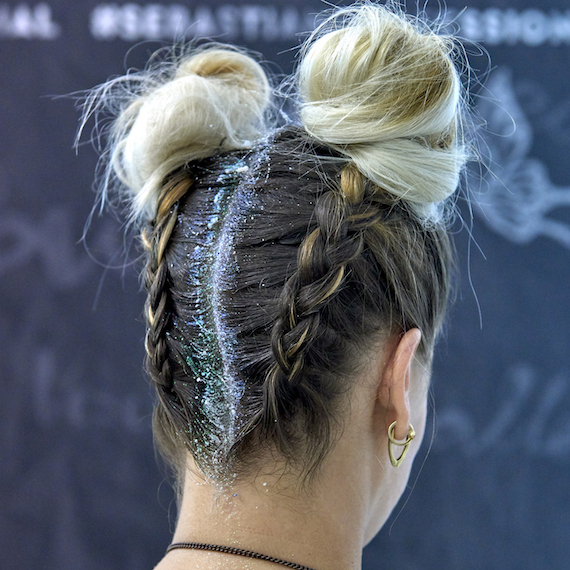 Create an out-of-this-world festival hairstyle with space buns. They’re easy to style and keep hair swept off your face and out of your way while you make your way from stage to stage. Experiment with braided space buns for a boho twist on this cult festival look. Step 1: Part hair directly down the centre, separating into two sections. Step 2: Create two high pigtails – one either side of your head – and secure with tight hairbands. Step 3: Take one pigtail and twist the length of hair from top to bottom. Then, create a coil around the pigtail hairband, twisting into a bun shape. Pin into place all around the edge to secure. Step 4: Repeat for the other side, fixing into place with a spritz of EIMI Super Set hairspray. Your space buns will. not. move. The perfect grunge-glam festival hair look? A punk-inspired faux undercut. Get this headbanging hairstyle by slicking back sides with skinny braids and backcombing the centre section into a mohawk. Step 1: Separate hair into three parts: two smaller sections at the sides and a wider section in the centre. Tie the middle of hair into a bun to keep it out of the way. Step 2: Start styling one side section. Tuck it behind your ear, then weave hair into a skinny boxer braid that trails in a ‘C’ shape down past your shoulder. Secure with a clear elastic, then repeat on the other side. Step 3: Take the centre section of hair out of its bun and tease with fingertips. Mist hair with EIMI Ocean Spritz, scrunching through mid-lengths for added texture. Lightly backcomb underneath the roots to build up extra volume. Step 4: Sweep the middle section of hair back and secure with a hair hook three inches from the roots, creating a slight quiff. Continue to evenly space hooks through the length of this middle section of hair until you have a scalloped silhouette. Once the fun is over, your hair might need some damage control, so here are some tips on how to repair post-festival hair. Looking for more festival hair inspiration? Discover summer-ready hair rings to try this season. You’ll also find endless hair ideas on the Wella Hair Pinterest board, and @WellaHair Instagram. Make sure to tag us in your photos with #WellaHair #AskForWella to show off your latest styles and be in with the chance to get featured on our social channels.